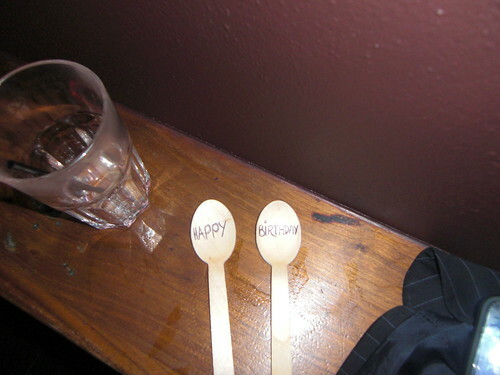 Birthday Spoons, originally uploaded by tehbus. Just a quick note to say I had a great time last Friday. Great company, with great drinks in a great bar meant big headaches all round on Saturday morning. Special thanks to the Yak and the Bowrings for their fabulous rendition of Happy Birthday, complete with dance moves courtesy of the Bowrings and some birthday spoon'age from the Yak perched precariously on a stool.